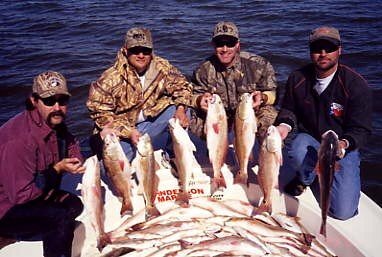 Tommy Countz, 281-450-4037, [email protected] reports that the lower temps have put a lot of trout and also some redfish in the Colorado River. Typically the river doesn’t begin to produce until the latter part of November, going into December. Countz likes bright colored paddle tail baits, something that imitates a mullet, something that you can swim the bait back to you. Chartreuse is one of his favorite colors. Going north from the Bay, does anywhere along the river work, or are there better locations than others? River fishing courtesy: Let the current take you down the river, using your trolling motor when needed. Don’t anchor even though when if you begin catching fish. “What you never want to do on the river is throw your anchor out, stop, and fish one spot,” says Countz. “It limits you to one area and it also screws up everybody else that’s making drifts. People need to understand that they are going to be more productive if they continue moving, come back through, hit it again, rather than just stopping in one spot. One of the busiest days of the year on the Colorado is the Friday after Thanksgiving. Countz said one day he counted 50-60 boats from the ICW all the way up past Selkirk. Another option: Night fishing is really good on the river in December. A lot of people have piers and turn their lights on and fish can be caught under the lights.